We have more than 25 years of experience with fan machine sales & repair in Orlando, FL, so we can answer any questions you might have. If your company uses industrial fans, you might encounter a malfunction with one of them. Over time and as the fans are used, the motors may wear down and break, or the blades inside the fan may also malfunction. If you have a problem with your equipment, give us a call at Pat’s Pump & Blower. We offer fan machine sales & repair to those in and around Orlando, Florida. We have more than 25 years of experience with fan machine sales & repair, so we can answer any questions you might have. We can also fix just about any brand and style of fan. One of the main uses for industrial fans is to dry out residential or commercial properties that have experienced flood damage. They provide fast and effective drying to floors, drywall, and other areas in a home or business. If your company offers emergency flood restoration services, you will need working fans in order to assist these frustrated property owners. Having fans that don’t work won’t help your company succeed, so call us to get all of your fans in working order. 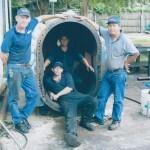 Our sales and repair teams are known throughout the world for their skills and knowledge in fan machine sales & repair. We offer 24-hour emergency service for some types of urgent problems, and we can also come to your site anywhere in the state of Florida for a free inspection. We can build and repair fans on-site, instead of having you bring the heavy fans to our office, which can save you time and money.